The Hindustan Times on 16th January published an article titled ‘Delhi BJP rejigged, turncoat Ilmi is VP’. 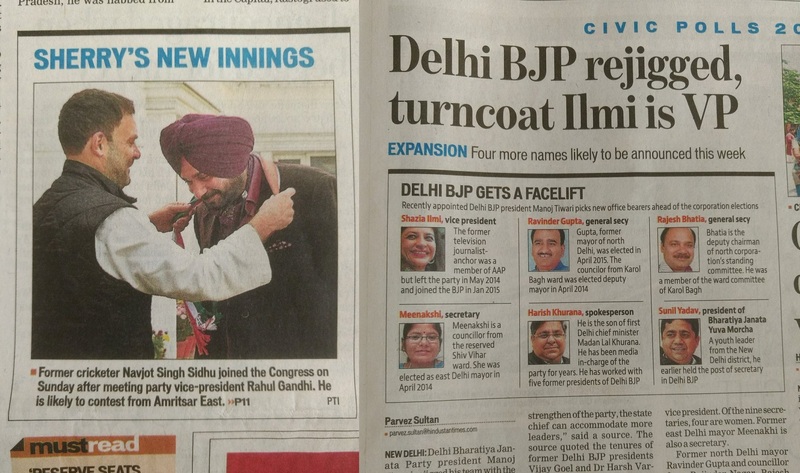 But, the same newspaper in the very same edition stoped short of using the “turncoat” adjective for another party-hopper, namely Navjot Singh Sidhu. The HT’s editorial team published the two articles in the same paper. So let’s first take a case by case view of both Shazia and Sidhu’s actions. Shazia Illmi was first part of the India Against Corruption movement led by Anna Hazare then transcended into the AAP by becoming its National Executive member and then quit AAP in May 2014 citing lack of internal democracy, Kejriwal’s ‘Jail politics’ among others. Navjot Singh Sidhu on the other hand has been party hopping for sometime now after he first resigned from the Rajya Sabha as a BJP MP in July and it was also speculated that he had quit the BJP. Just days after that his wife issued a statement that AAP was the only option for him, but no formal notice came. Then he launched his own party named Aawaz e Punjab on 8th September. Just days after he had launched it, he formally quit the BJP meaning he had not done so for all these days. After speculations of what he exactly would do, it was reported on November 1st that he might not join the AAP and on 27th November it was reported that his barely 2 months old party was all set to break after two of its founding members were set to join the AAP. And finally after much drama, it was announced yesterday that Sidhu has joined the Congress and has started putting out statements like he is a born Congressi and it was a Gharwapsi for him. So if Illmi has indulged in a turncoat like behaviour then Sidhu has indulged in something worse and shouldn’t just be described as a former cricketer. But maybe because Illmi chose to join the BJP or because she is a woman’s she’s being meted out such a title and maybe because Sidhu chose to leave the BJP or join the Congress, he is being treated much more gently? Recently we had also reported how Indian Express was also using double standards by criticising the BJP for holding a meeting in Dalit areas despite the Supreme Court which barred political parties from canvassing votes on the basis of caste or religion and just 11 minutes later put out the tweet that Congress invoked Rohith Vemula after touring Dalit villages without once mentioning the Supreme Court’s order.